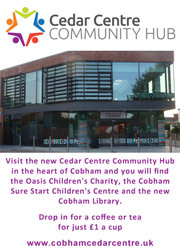 The Surrey Hubs are now Mobile! The Surrey Hubs East now has a Mobile Hub service. If you need information and support around advocacy, benefits, independent living, housing, employment, transport, etc, but can't easily get to the nearest Hub (Redhill, Dorking, Epsom, or Walton on Thames), then look out for the Mobile Hub coming to a venue near you. We are looking to bring our services to the wider community and would welcome any support to help us to reach people that may benefit from a free information service. We are looking for suitable venues and also looking for volunteers to assist with providing the service. The Mobile Hub East has previously visited The Wells Centre, Epsom; Regents House , Horley; The Fairfield Centre, Leatherhead; The Meeting Place Community Hub , Bookham; The Longmead Centre, Epsom; Whiteley Village, Walton on Thames; and Mary Frances Trust, Leatherhead. The Mobile Hub is looking forward to returning to each venue on a regular basis, and to expanding the service to other venues within Elmbridge, Epsom & Ewell, Reigate & Banstead and Mole Valley.